In the short time that students attend the academy, their academic achievement improves from poor to outstanding. School is now closed for the Easter Holidays. We look forward to seeing everyone back on Monday 29th April 2019! 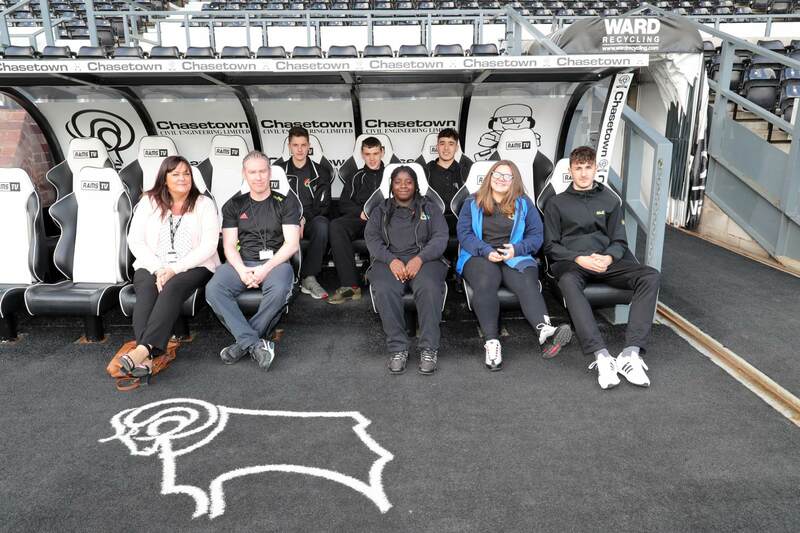 Derby Pride Academy in partnership with Derby County Football Club provide good examination outcomes and redirection work for high need students in an alternative provision setting. When students arrive at the Academy, they are often reluctant to embark upon Art. The way we deal with this reluctance is to give the students a light box. After a period of time this is removed from them. By this time, the students have learnt new techniques and methods of toning and shading. This has a positive effect on the students and increases their creative capacity and confidence. Students learn more effectively when they can link their experiences to what they are familiar and motivated by. Learners find it very difficult to learn with understanding from tasks which have no meaning that is apparent to them. They learn more effectively when they can link new experiences to what they already know and are motivated by curiosity to answer questions. Activities should therefore enable students to engage with real objects and with real problems. An example of this method in practice is the teaching of the complexities of the cumulative effect through products known to the students. These include I-Phones, trainers and X-Box Games. Once students understand the theories using familiar items, other concepts can be added to extend understanding and apply to other situations. Media will be delivered across the academic year, split up into 4 units during the first year of KS4 and further units in the second year. At the end of Year 11, students will be entered into and participate in GCSE Media Studies papers and be able to gain a GCSE in Media Studies. Due to the amount of writing required for higher grades in English Language and Literature, strategies to encourage extended writing and the use of Point Quote Comment (explanation/analysis/evaluation) are sourced most lessons. In addition, the mark schemes led themselves to the higher order challenge and of Bloom's Taxonomy/Anderson's revised taxonomy- thus, lesson objectives incorporate Bloom's taxonomy to support students with the challenge required in the different exam questions. Due to the amount of writing required for higher grades in History, strategies to encourage extended writing and the use of Point Quote Comment (explanation/analysis/evaluation) are sourced regularly. In addition, the mark schemes lead themselves to the higher order challenge of Bloom's Taxonomy/Anderson's revised taxonomy- thus lesson objectives incorporate Bloom's taxonomy to support students with the challenge required in the exam questions. ICT is split into different units to help breakdown the delivery. Each topic has a link to the previous topic so students can see a connection and development within their work. Students learn the content by completing tasks that require them to practice using the various technology and software. This not only helps them understand the current topic but builds a strong foundation for using a computer. Although we do not currently offer Languages as a subject at Derby Pride Academy, if a student's first language is not English we will encourage them to enter a GCSE in their first Language. One student is currently sitting a GCSE in Spanish. Procedural fluency and conceptual understanding are developed in tandem as each supports the other. Once students demonstrate fluency in a given mathematical concept they are progressed to using reasoning in applying this concept. Challenge and the opportunity to deepen understanding of key mathematical ideas is provided for all. Differentiation is achieved through paying attention to the levels of support and challenge needed to allow every student to fully grasp concepts and ideas. Acceleration onto new content is avoided. Instead, these students are challenged by deeper analysis of lesson content and by applying the content in new and unfamiliar problem-solving situations. Only on rare occasions where there is a significant need for curriculum intervention will a student be working on different content to the rest of the class. Students at the Academy can sometimes struggle to maintain focus so a variety of ways to learn and achieve are required. Each lesson objective incorporates Bloom's taxonomy and is personalised as students work at different paces. Class discussions are held when introducing new topics and to reinforce learning. Being aware of students' learning styles and using VAK every lesson is very useful-this can be through using worksheets, books, internet, PowerPoints, discussion and simply listening. Documents, such as the Early Years Foundation Stage Statutory Framework, are used for reference. Topics are related to real-life situations where possible and the introduction of an imaginary early year's worker helps to do this. In order to reinforce learning, we use quizzes, play bingo and perform other activities so that students take part in revising without realising they are doing so. A high quality Physical Education inspires all students to succeed and excel in competitive sports and other physically demanding activities. It also provides opportunities for pupils to become physically confident in a way which supports their health and fitness. Learners find it very difficult to learn with understanding from tasks which have no meaning that is apparent to them. They learn more effectively when they can link new experiences to what they already know and are motivated by curiosity to answer questions. Answers should therefore enable students to engage with real objects and with real problems. Therefore, it is important to make Science relevant by linking the topics to real life situations so that students can discover how Science learning related to the real world. It follows that being able to see the connections between different ideas in Science, as in the understanding of scientific ideas and how they were developed, is an important part of preparation work and life.